I came across this cobalt and oxblood color combination on Pinterest recently and knew I had to recreate it. I was so struck by it immediately and couldn't wait to pair the two. I forced myself to wait for September, though, because I couldn't justify the faux leather leggings in August -- even though I was looking for every excuse! Add in a pair of white pumps and a lucite clutch and you have my NYFW day two outfit! Completely agree with you on cobalt - I'm looking to add more to my closet too. Love how you paired it with the oxblood - never would have thought to try this but it totally works! Cobalt meet red head. Red Head meet cobalt. You are now best friends! Seriously, this blue is perfect on you and I love the color combination with oxblood. LOVE this color combination! Those pants are perfect! 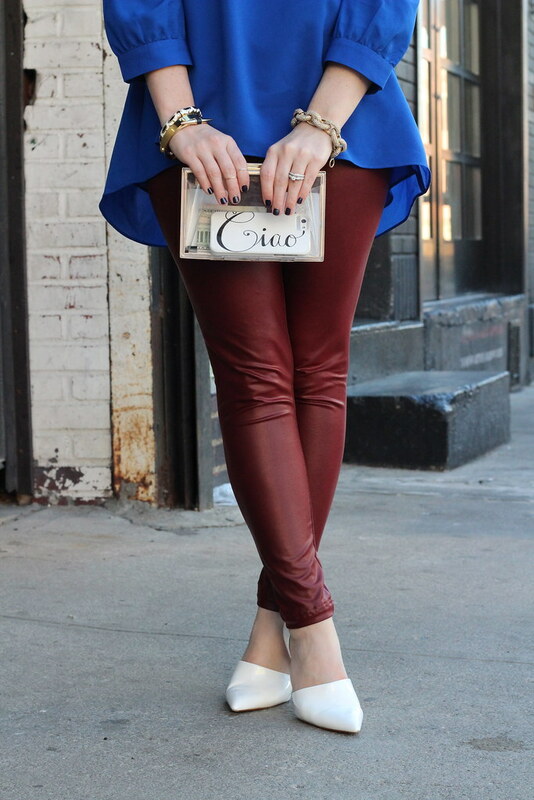 I LOVE cobalt and contrasted against rich oxblood is so stunning! Your hair looks perfect as always and I'm kicking myself for not purchasing that clutch when I saw it awhile back! Such a good F21 find!! I NEED that ciao case!! So adorable! I hadn't thought of this combo before but I LOVE it! And it's perfect paired with the white heels and lucite clutch to keep it still early fall-y! You look amazing! I love the color combo! Those oxblood pants are fabulous! I love this color combo! You would think it might come off Patriotic a bit but it doesn't at all! And those leggings are awesome! 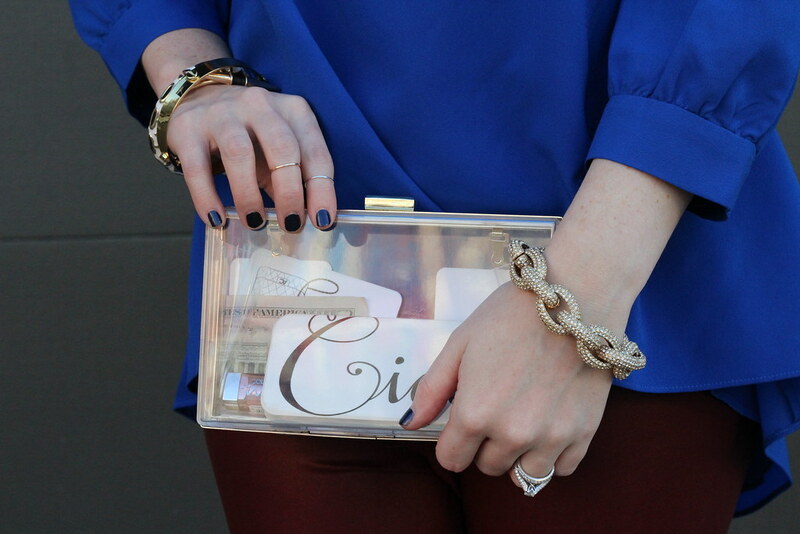 I'm obsessed with cobalt, especially paired with black! It's such a vibrant color that it just makes you feel better when you wear it. Love this combo on you! You look amazing in this color combination, and I'm IN LOVE with those oxblood leggings! This is a great look for bingo night or the early bird special at S&S cafeteria. Thanks for the inspiration! This is one of my favorite color combos for fall! Loving this look! The unexpected color combo is perfect! This is such a great and unexpected color combo! You look fabulous!